Good news! You're coming off the shelf tonight! My wife and I (and our kids?) 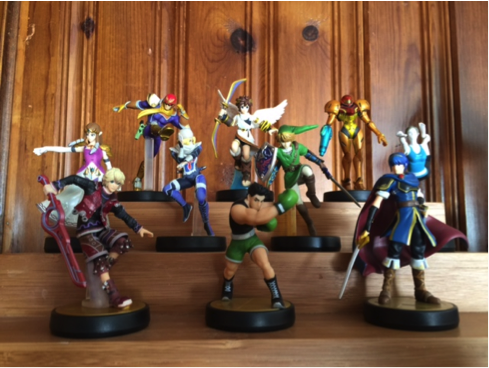 have lots of amiibo. Yep, we’re in deep enough to know that the plural form is amiibo, not amiibos. We were excited to have a reason to pull them off the display shelf. But, that reason is not compelling enough to add much needed value beyond display, and they do look awesome hanging out on our china cabinet. AmiiboTAP is free, for what it’s worth. We didn’t find it worth the space on the hard drive. Scanning an amiibo scores you twenty-seven minutes, in most cases, of time with a Nintendo or Super Nintendo game. These minutes are split up into three-minute scenes. Some games have nine, others four to seven scenes. Sonic knows this isn't worth the time. Our amiibo collection is vast enough to have unlocked all the glorified demos available in AmiiboTAP, and to start seeing repeats of titles…. There are a few games we haven’t played before. My wife initially thought that “scene” meant we would be watching a video playthrough. She was only slightly more impressed when we actually played through a bit of Wario’s Woods. The playtime was enough to know why we missed that game back in the day. Here are the games unlocked by our amiibo. This certainly appears to be random. In a year, we’ll revisit the demos of amiiboTAP. When our daughter is old enough to experience some of the classics, TAP might make more sense. I’m sure kids will enjoy tapping their amiibo on the gamepad, registering owners, nicknaming them and watching the game present animations – over and over…. Allowing kids to play through bitesize chunks of the classics is a great way to expose them to older games and mechanics, without forcing them to endure outdated gameplay for too long. For those of us familiar with much of Nintendo’s back catalogue, TAP is a reminder of the games we loved and justification for the few games we’ve missed. But hey, all our amiibo now have registered owners and nicknames! Posted on May 2, 2015 by Ryan Thompson and filed under Reviews and tagged amiiboTAP amiibo nintendo nostalgia marketing virtual console retro.